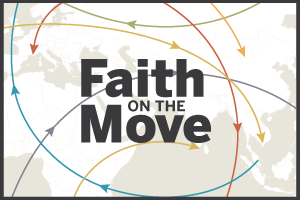 Another way to see patterns in global migration is to look individually at each religious group. 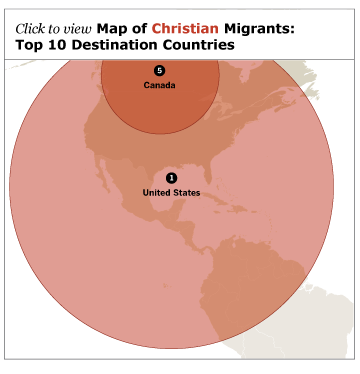 Among Christian migrants, the main destination regions have been North America and Europe. European countries, as a whole, are also the leading source of Christian migrants, accounting for more than four-in-ten worldwide (44%). About three-in-ten Christian migrants originate from Latin America and the Caribbean. 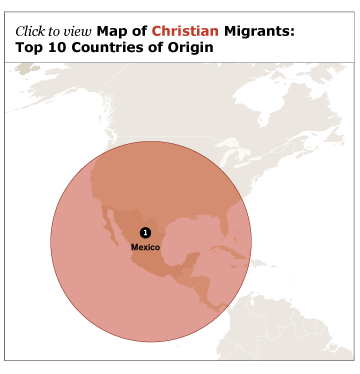 The largest single country of origin for Christian migrants, however, has been Mexico, with more than 12 million. Most of them now reside in the United States, which has taken in a total of about 32 million Christian migrants, nearly two-thirds originating in Latin America. 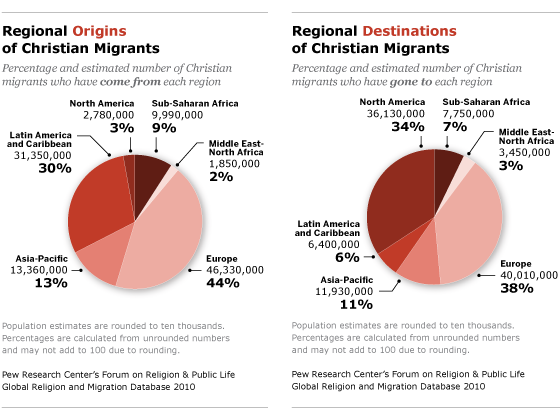 Other European countries (such as the United Kingdom, Poland, Germany and Italy) also are the origin of sizable numbers of Christian emigrants, many of whom have gone to the United States, Canada and Australia. Meanwhile, most Christian immigrants living in Germany (about 5.5 million) and Italy (about 2.5 million) were born in other European countries, including those in Eastern Europe. The same is true for almost half of the United Kingdom’s nearly 3.5 million Christian immigrants. Spain’s large population of Christian immigrants (nearly 4.6 million) consists principally of migrants from Latin America as well as Romania, the United Kingdom, Germany and France. Many Christian immigrants to Canada (about 4.2 million) and Australia (about 2.8 million) have come from Europe, especially the United Kingdom.